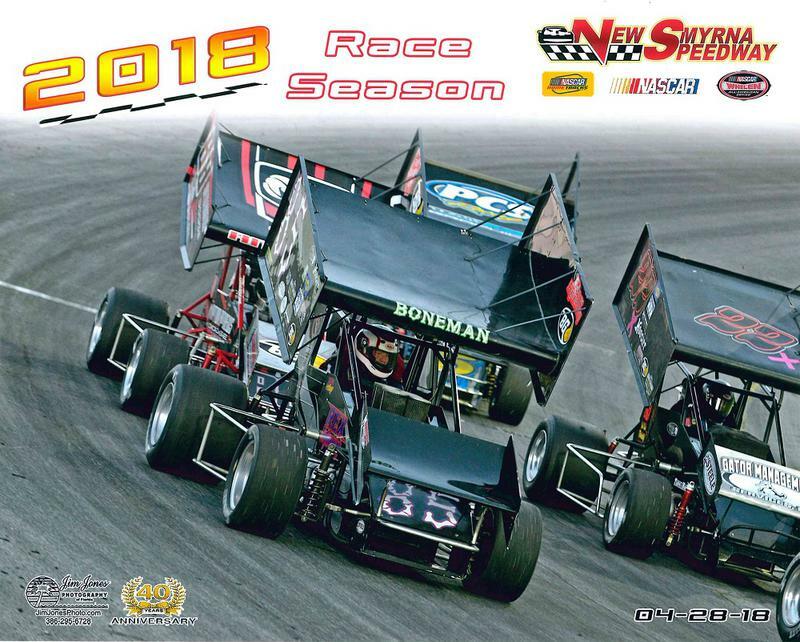 ​We kicked off the season with Southern Sprintcars tonight at 4-17 Speedway. What a cool track for sprints! The stands were full (again), and we had a great time. Steven and I were a two man team tonight. The kid worked hard! 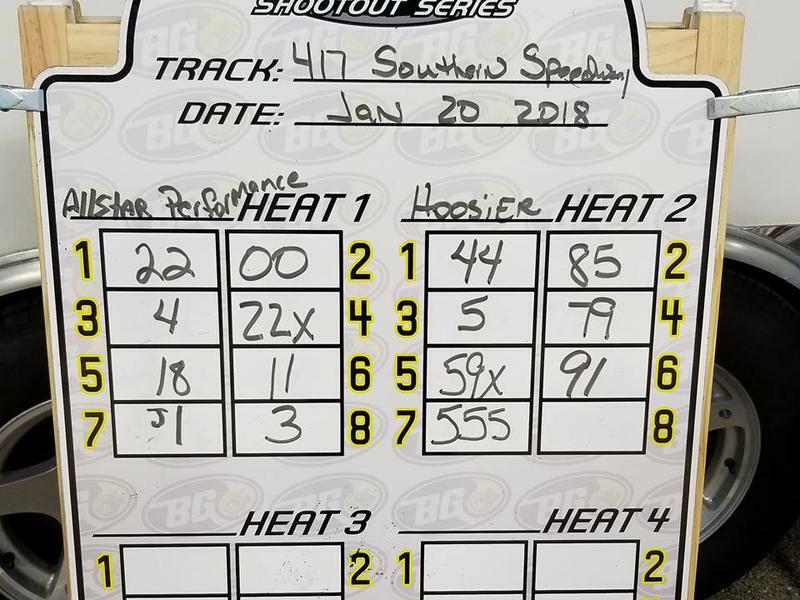 Both the heat and feature, I was on the outside front row. Preparing to light 'em up in the feature, and starting next to race winner Troy DeCaire. As you can see on the scoring pylon, I finished 6'th. 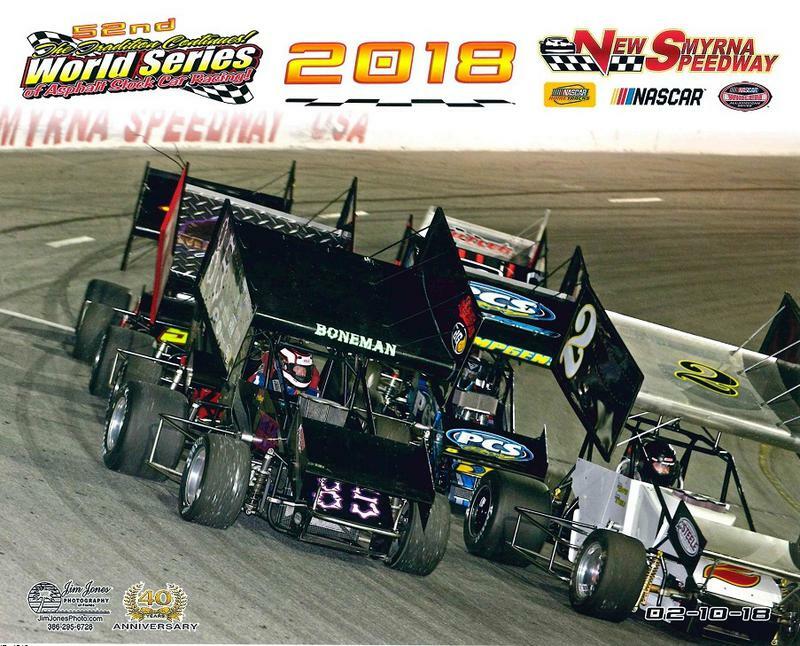 2-10-18 at New Smyrna's 52'nd annual World Series. ​We showed up with 17 cars tonight. 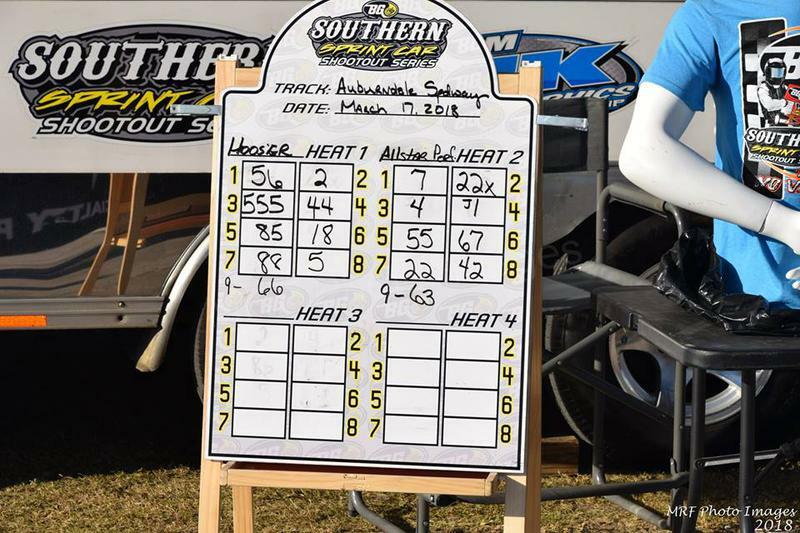 Once again, I started on the outside front row for the heat and feature. That is four starts in a row. My New Smyrna malaise continued with a 9'th place finish. 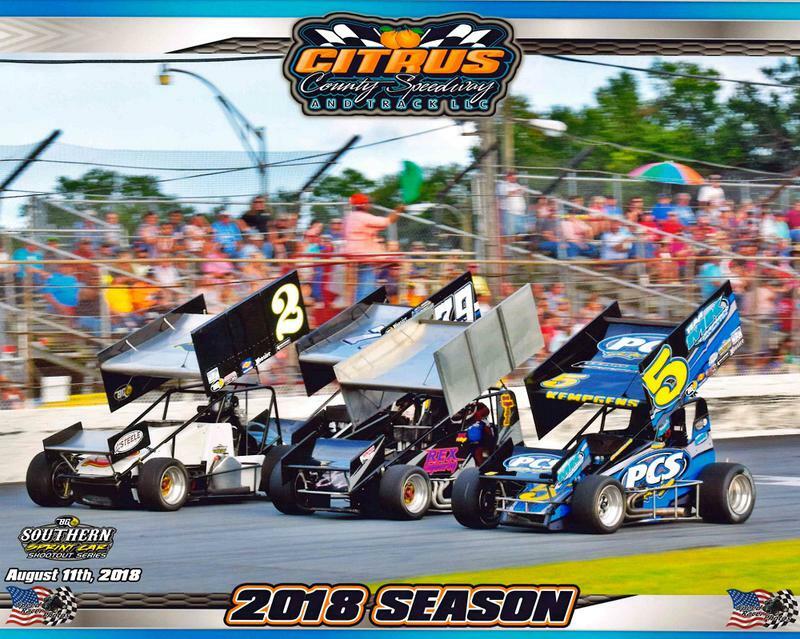 This was our first sprintcar race at Auburndale since 2014, and just my second race there. I love this track! 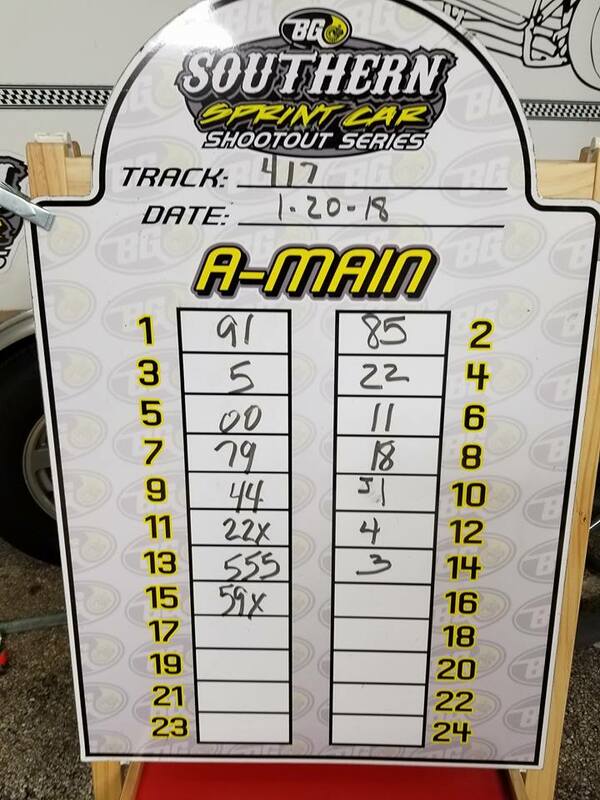 We had 18 cars tonight. AND Steven got a ride in a TQ! 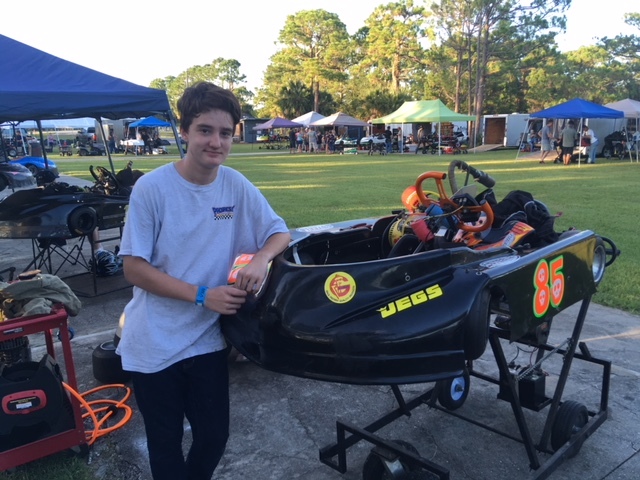 He brought his helmet bag, "because you never know", and sure enough the Florida TQ's showed up with a car without a driver. He didn't get to practice, but ran the heat and nailed it. 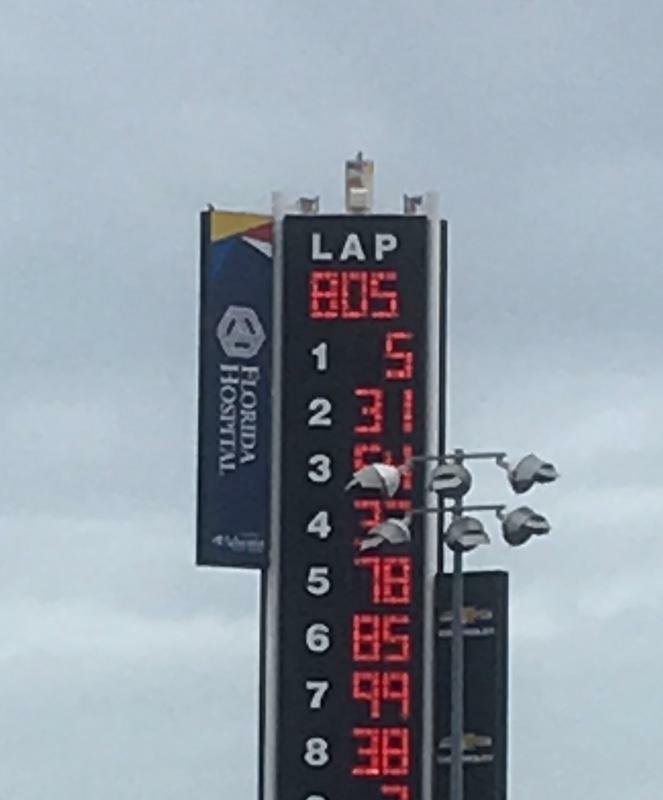 The car owner was happy, he had never seen the #58 go that fast. 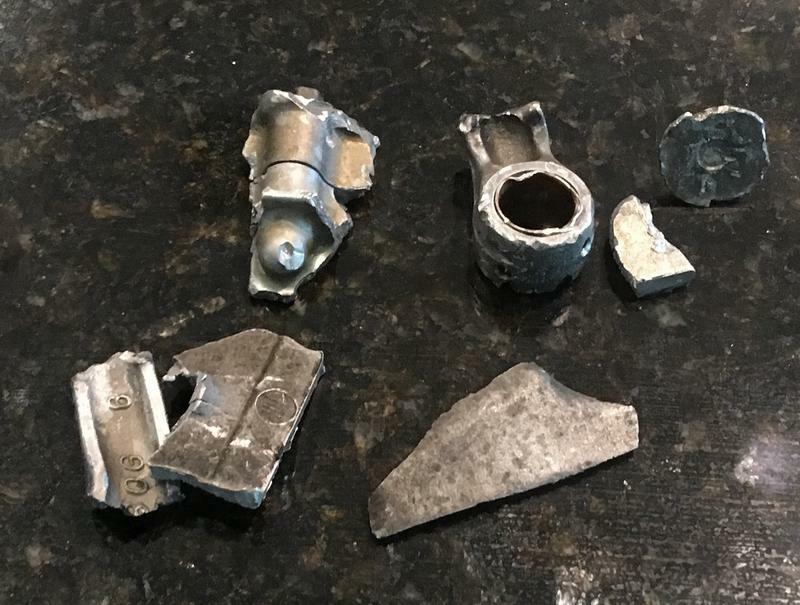 Sad to say, the driveline blew up in the last lap, so he didn't get to run the feature. 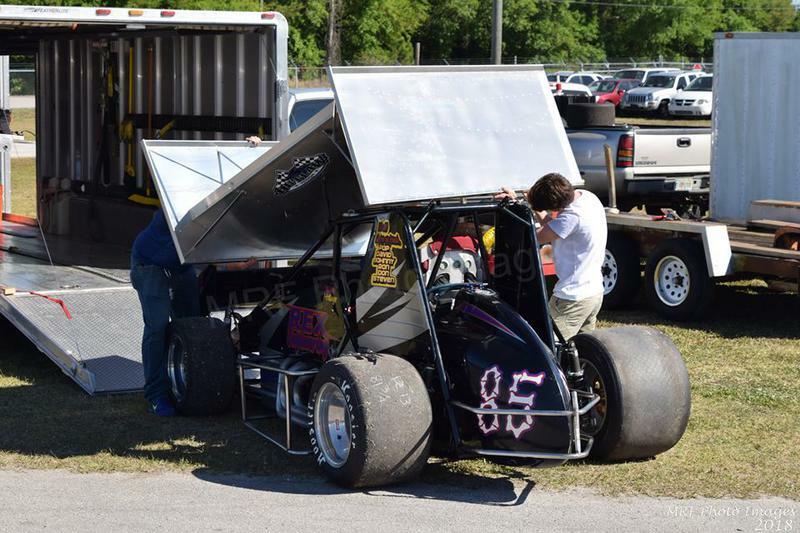 Steven and Chase were figuring out the new wing. Fun racing tonight. I finished 8'th out of 18, but ran toward the front in the first half of the race, and ended up on the lead lap. Steven and I arrived early and set up the car on SR 44 by the speedway marquee. 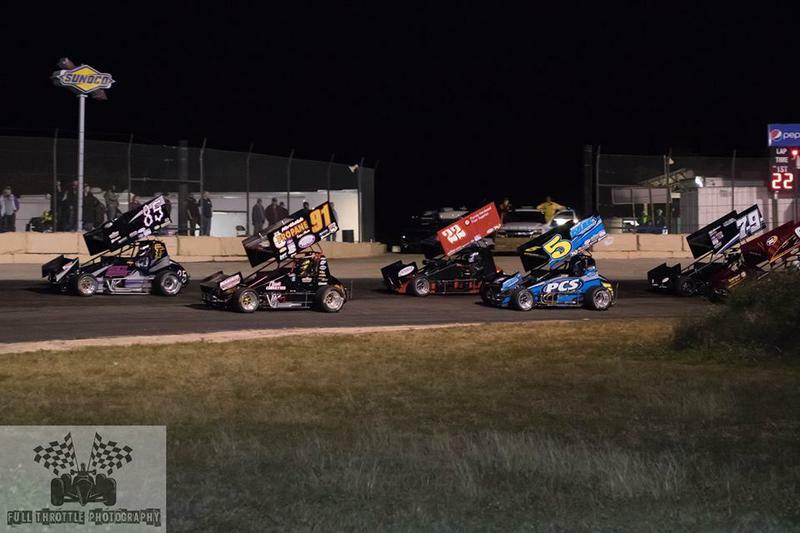 It was a rough night for Southern Sprintcar. We destroyed two fast cars tonight. I finished 3'rd in the heat and 8'th in the feature, but am still not happy with my driving at this track. 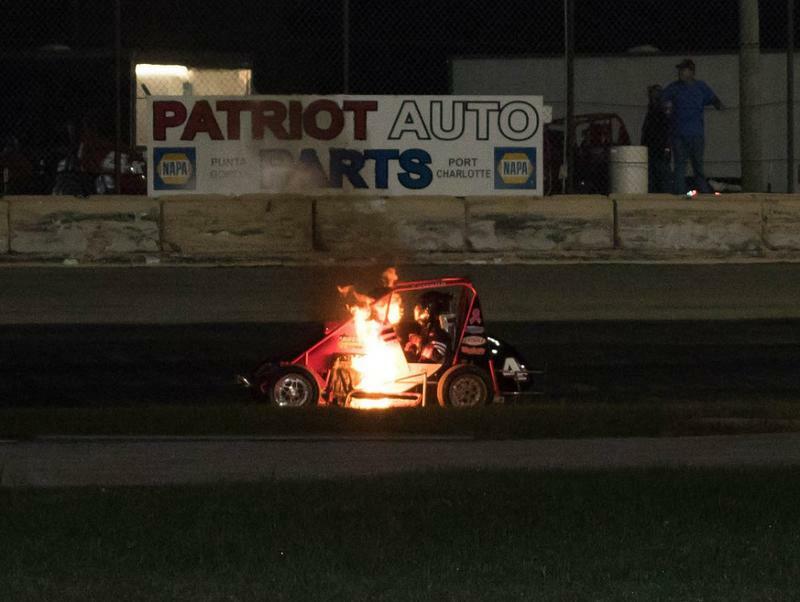 Steven drove a TQ midget tonight, so I left my car at home. I wanted to concentrate on his race. 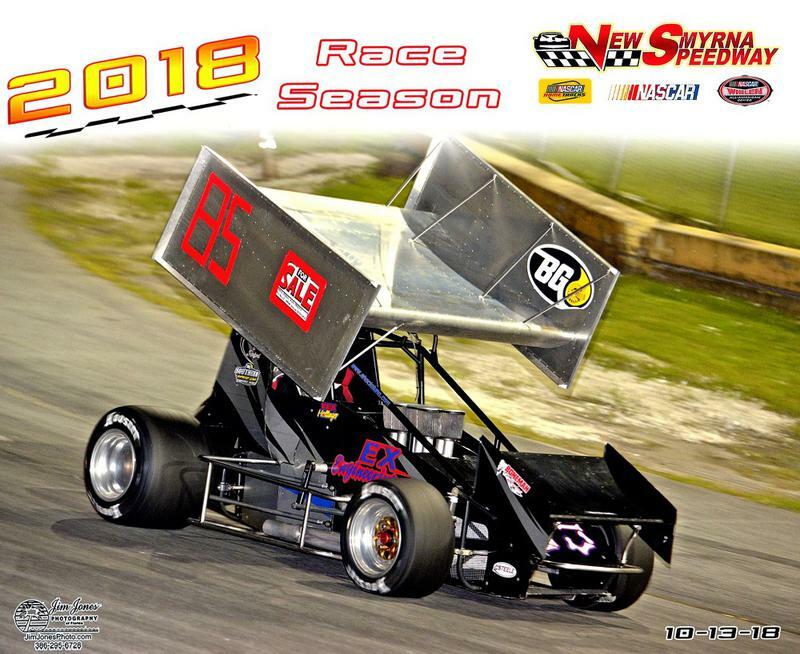 Yes, I missed being in the sprint car race, but I made the right decision. 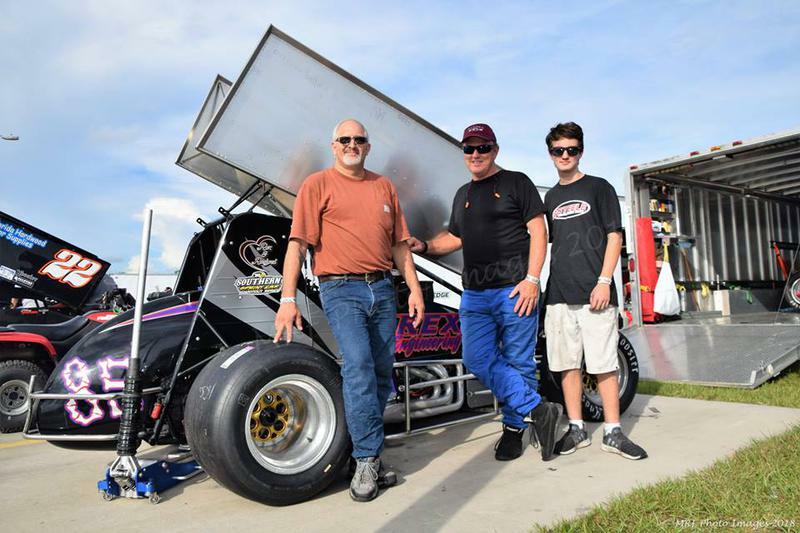 The car was owned by Jimmy Wilkins; a winning car builder, owner and driver, and a darn nice guy too. 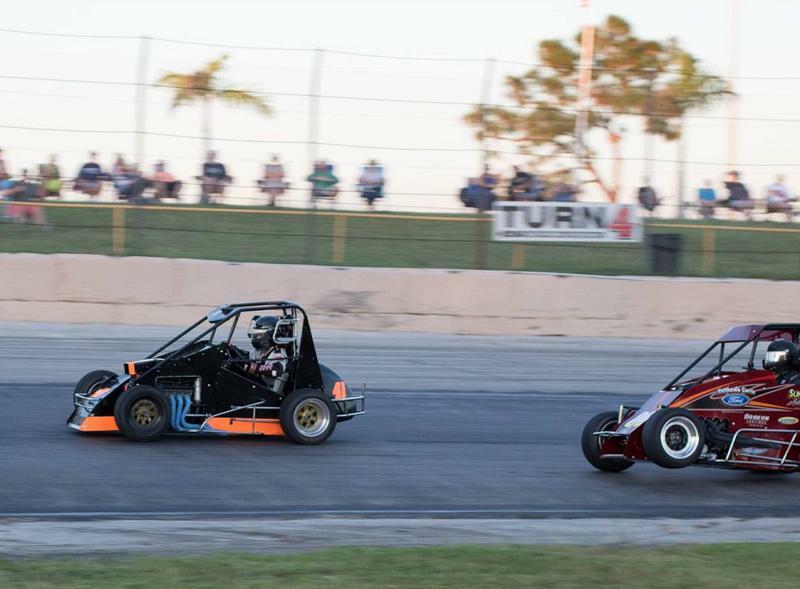 We were racing with the Florida Midget Racing Association. The kid climbed in, mashed it, and we had a blast! This was a great way to learn open-wheeled racing; there were competitive cars, but not over-whelming traffic either. 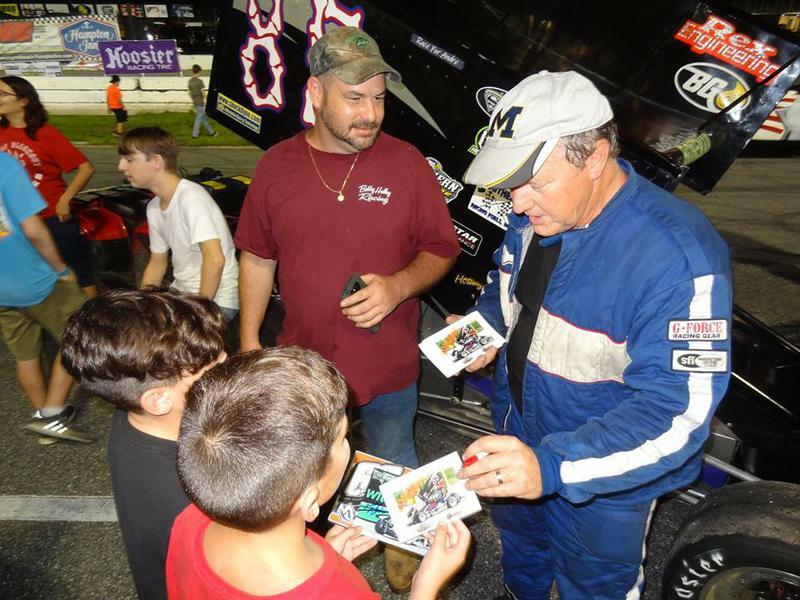 Seven TQ's were on hand tonight, and Steven got to mix it up with them. Jimmy's car was well prepared and ran like a watch all night. That freed Steven to concentrate on his driving. He started last in the heat and made it to forth, then started last in the feature, and finished third in the 25 lapper. Steven has an odd pattern on his first night in a new class. 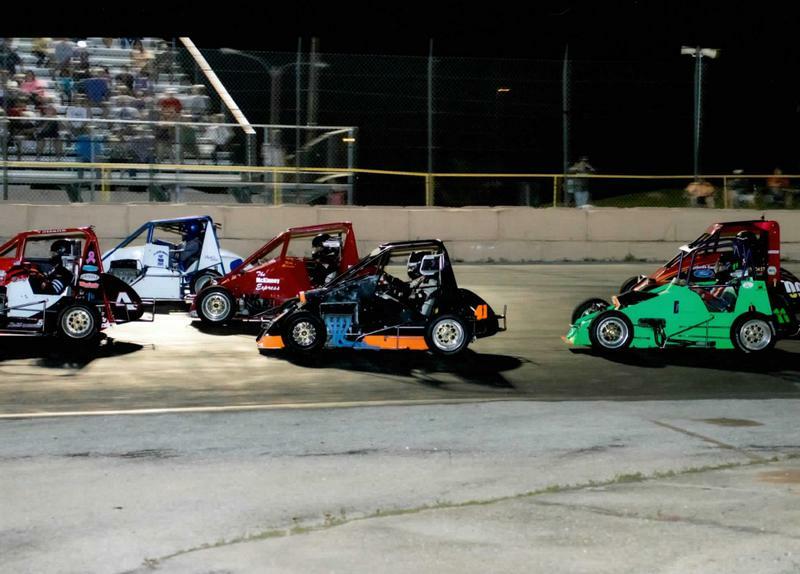 This has happened in karts, Bandoleros and Mini Cups. 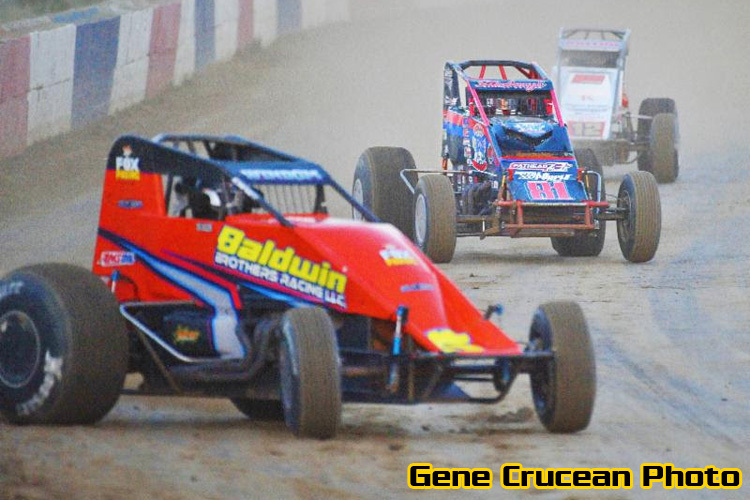 He will spin out in the first lap or two of practice, and then go three wide in the first lap of the feature. Yes, they both happened tonight in the TQ. The good news is that he learns, and rarely spins out after the first time. Overall, he and I loved our night in TQ's, and somehow we will be back for more! 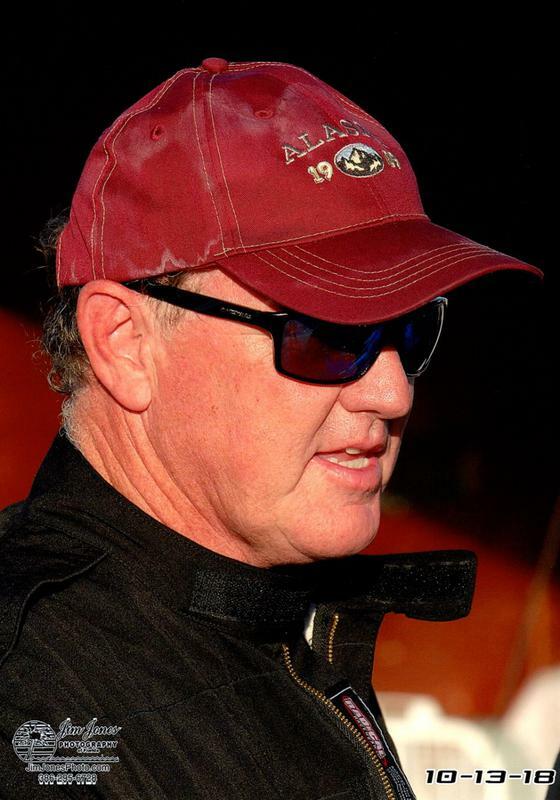 Click HERE to see his interview with track announcer Jason Beckner. I've always wanted to make a racing trip to Indy, and this was my lucky year. 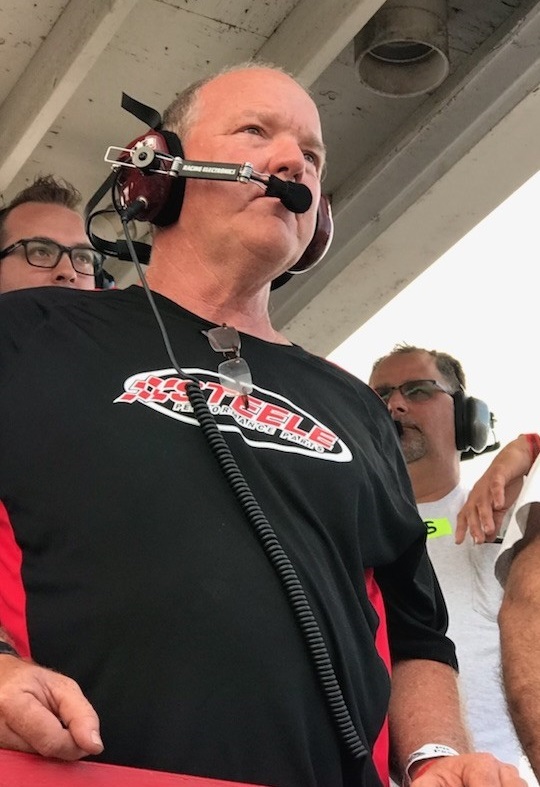 Johnny Gilbertson made his first attempt at running Anderson Speedway's Little 500, the most unique and challenging sprint car race in our business. That sealed the deal; as soon as we knew Johnny was racing, Steven, Roslynd and I started arranging tickets! 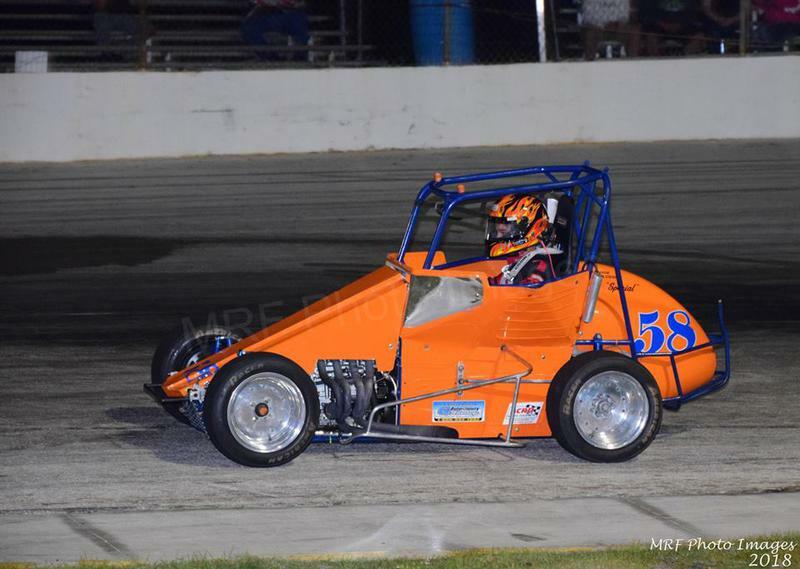 We flew to Indy on Wednesday, and headed to Terre Haute Speedway for the Hulman Classic, a 50 lapper for wingless sprints. 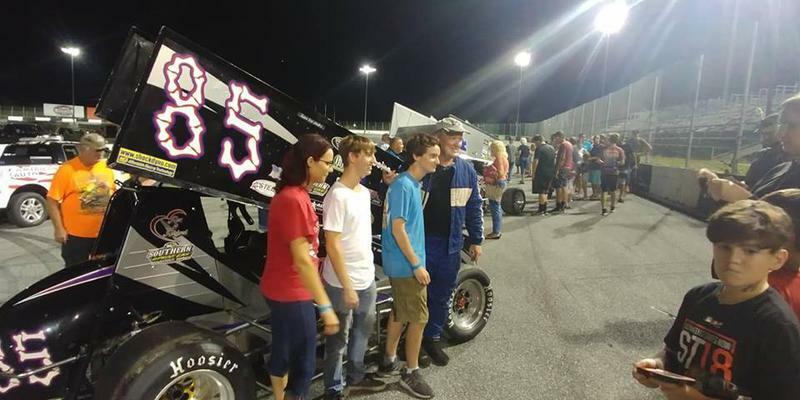 A fun night for sure; we collected a big group of Florida sprint fans, organized a winners pool and had a blast. We practiced at Anderson, and qualified in the afternoon. Johnny ended the day in 27'th; in the show so far, but without too much safety factor. 40+ cars attempted to qualify. 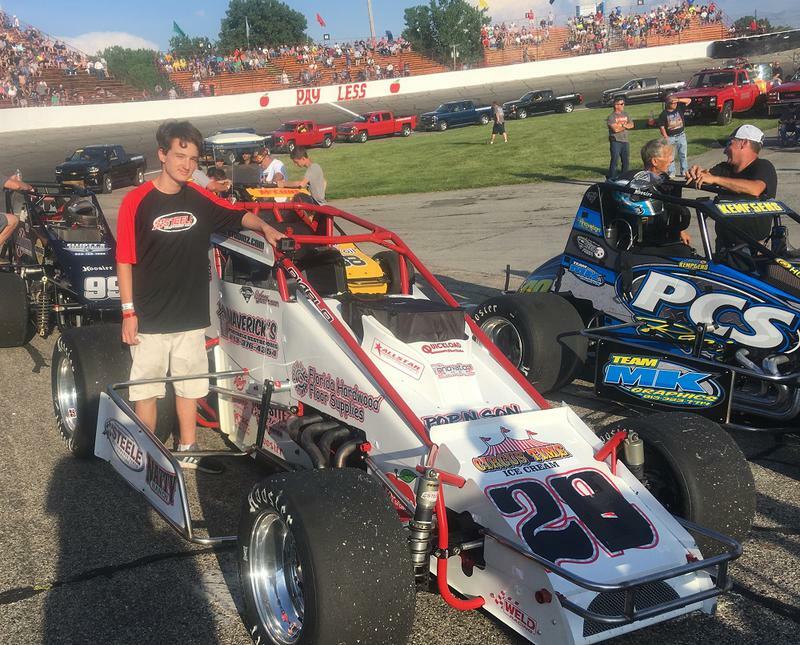 Indianapolis Fairgrounds for the Silver Crown cars and the Hoosier 100. This is an enormous 1 mile dirt oval; I've never seen anything like it. 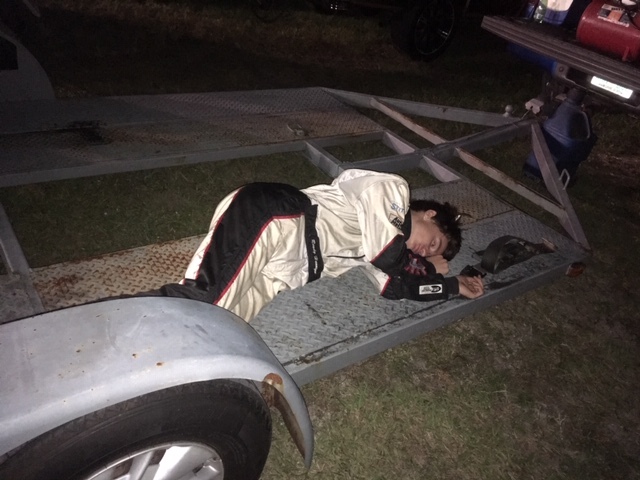 And I won't again either; the 36 second laps put us to sleep, so we bailed after 50 laps. 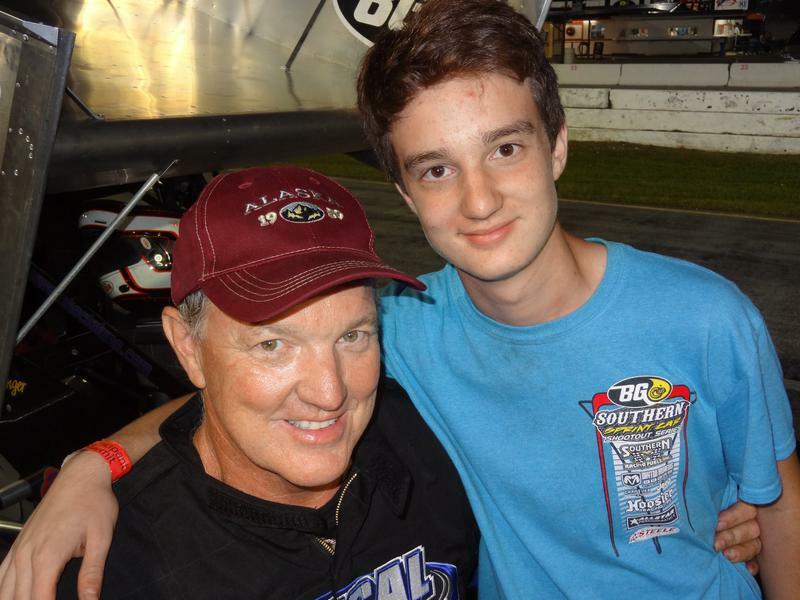 However, it was cool to see Ken Schrader win the modified feature. 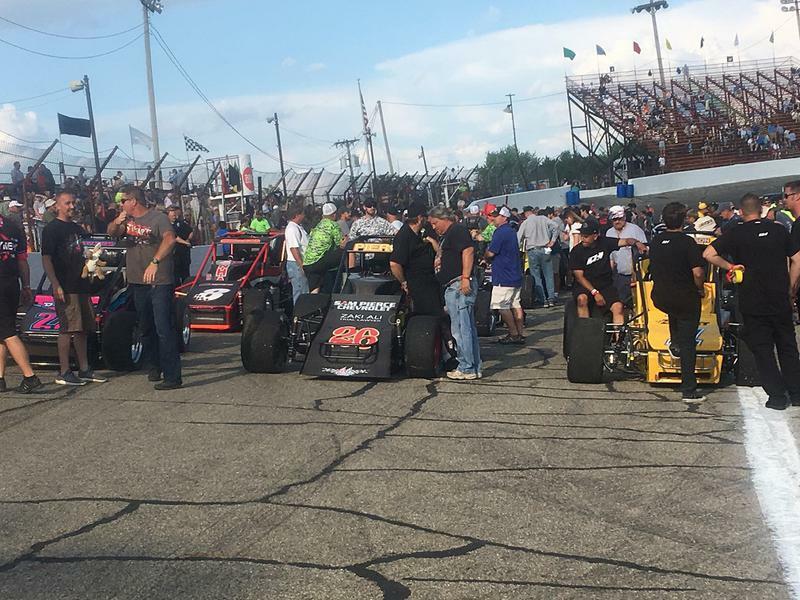 ​After a tense day at the track, we found ourselves locked in the Little 500 field, starting 29'th. 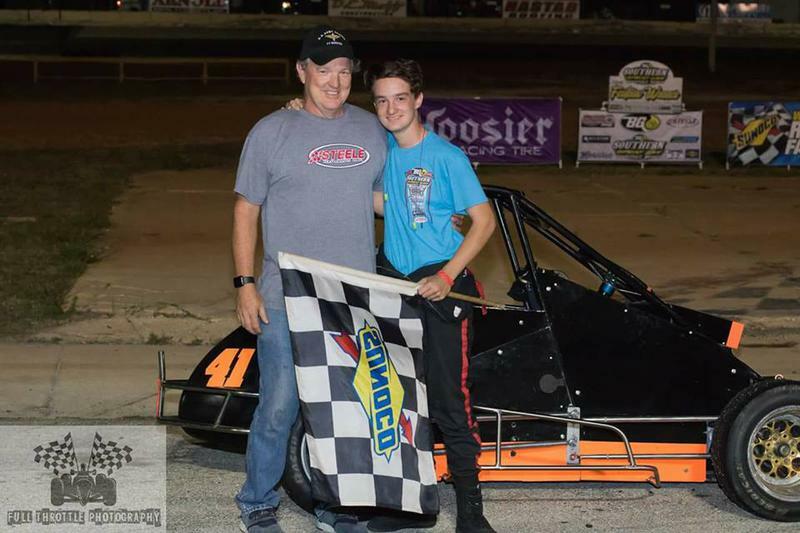 At night, we were off to Lucas Oil Raceway for the Dave Steele Carb Night Classic. 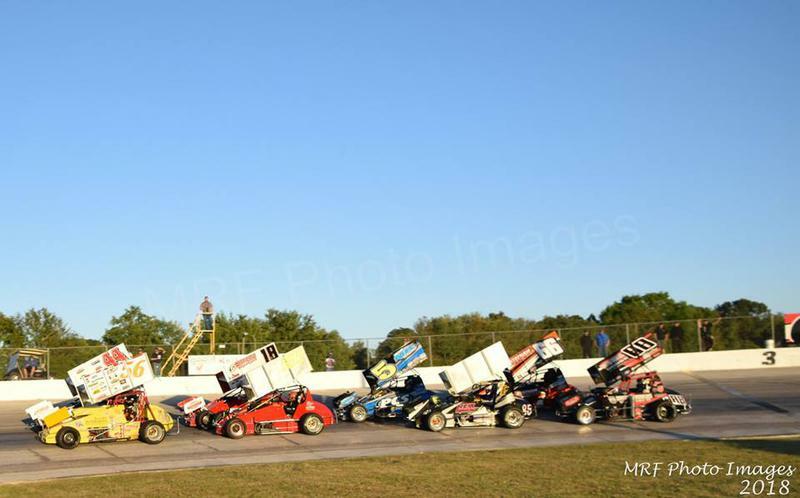 It was a 100 lapper for the Silver Crown cars that also raced last night. Race fans, this was the best race I've seen for years. 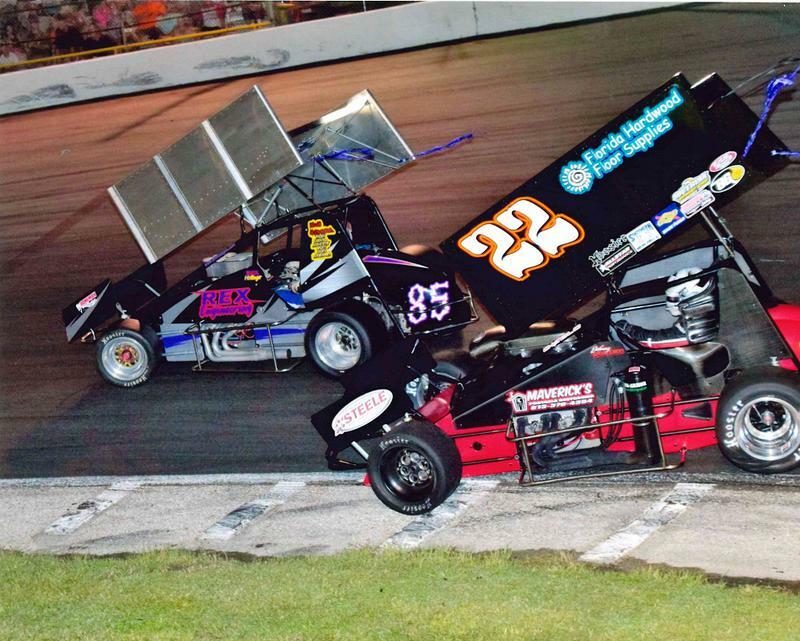 Tanner Swanson, shown here in the #2, set fast time, but elected to start last and try to win a $5000 bonus. He dug and scratched the whole way, and came up one spot short while his brother Cody took the win. An outstanding show! It takes all day to set up for this one, so we were at the track from early morning on. Steven's job was the front jackman on pitstops. I was spotting for the driver, and Roslynd had a seat right in front of where I was standing. We had a variety of problems in our rookie year, and only lasted until lap 160 or so when the brakes blew apart. The finishing position was officially 26'th, but we are determined to come back in 2019 and give this spectacular race another shot! On the day after the race, we made our first visit to the Indy 500. 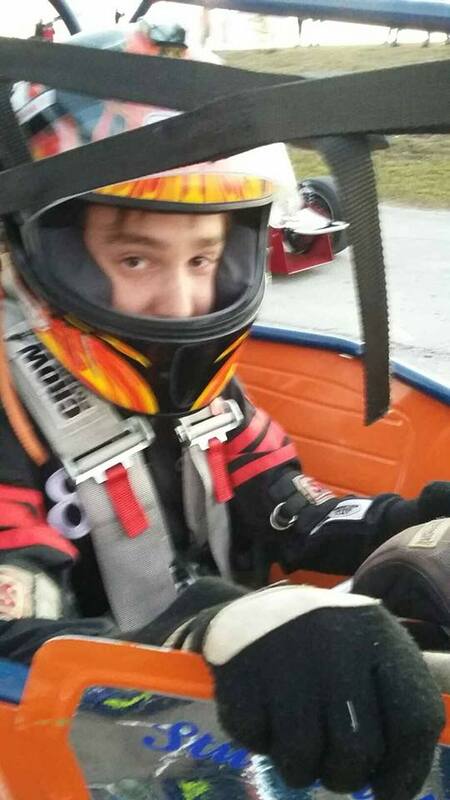 ​On our last day in Indianapolis, we ended up at Fastimes kart track. 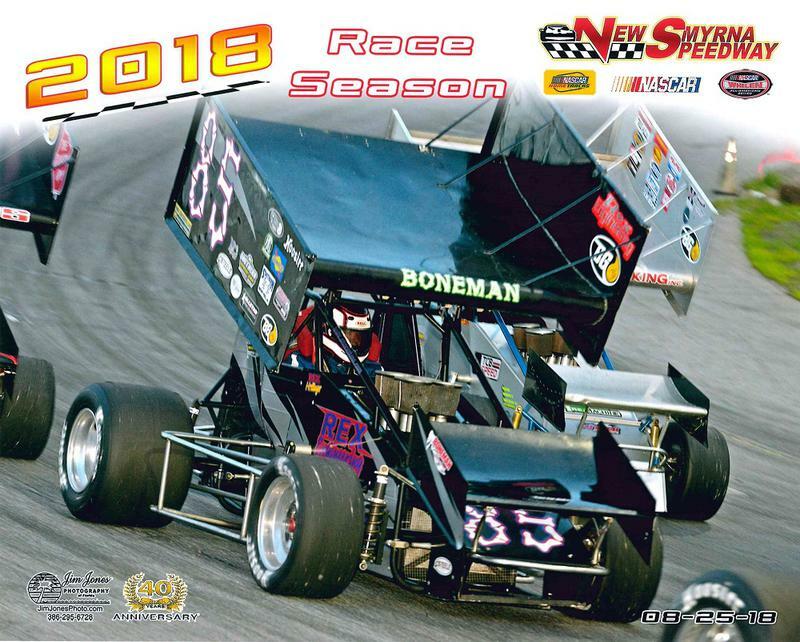 Indycar driver Pippa Mann drives a pink and black #63, and she is involved in this track. They also claim that Indy winner Will Power trains here for hours. I believe it, the corners are rubber, so the G forces are very high. What a cool ride! This was a great way to end a super week.! 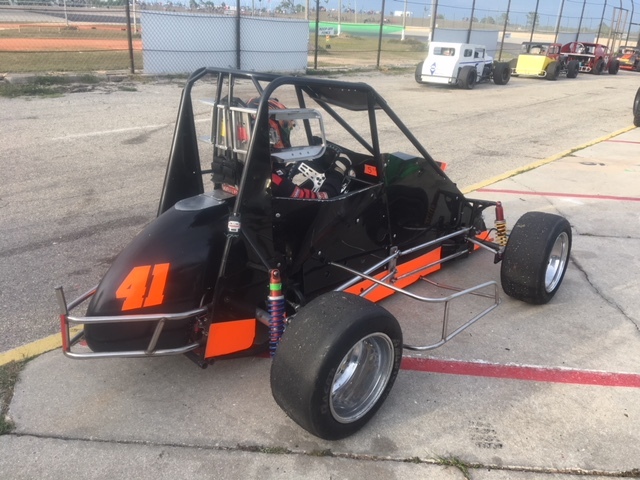 Steven was back in the Jimmy Wilkins owned and prepared #41 for the second week. 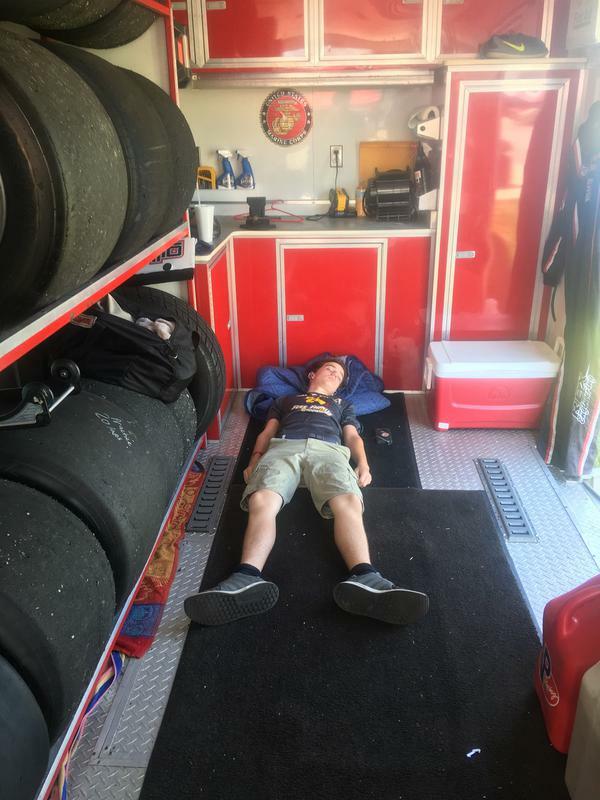 This was a HOT day at the track! 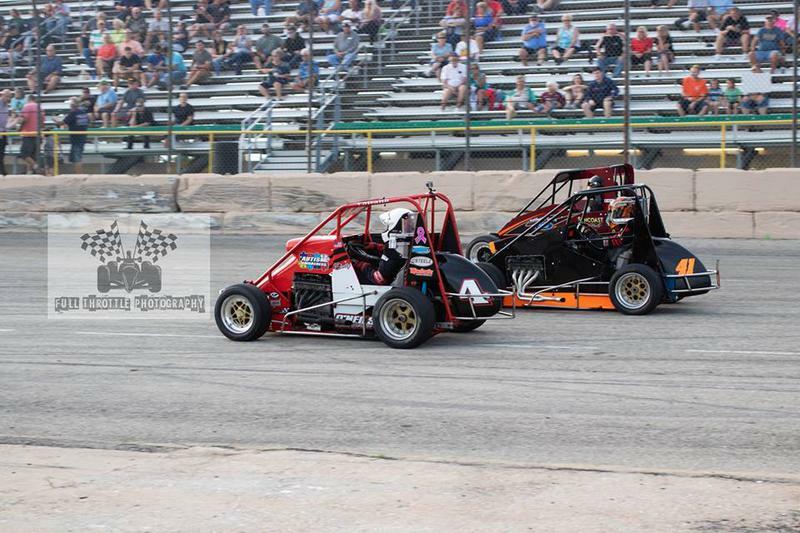 Steven finished second in the heat race, and was running third in the feature when engine problems to appear. On lap 20, the motor exploded at the flagstand, and Steven did a quick 2 1/2 spin to the right. TQ's don't spin to the right very well, they often flip, but I believe that his tires were so covered with hot oil that it kept him upright. He stopped 2 feet from hitting the wall, so thankfully there was no car damage, and no one else was involved. 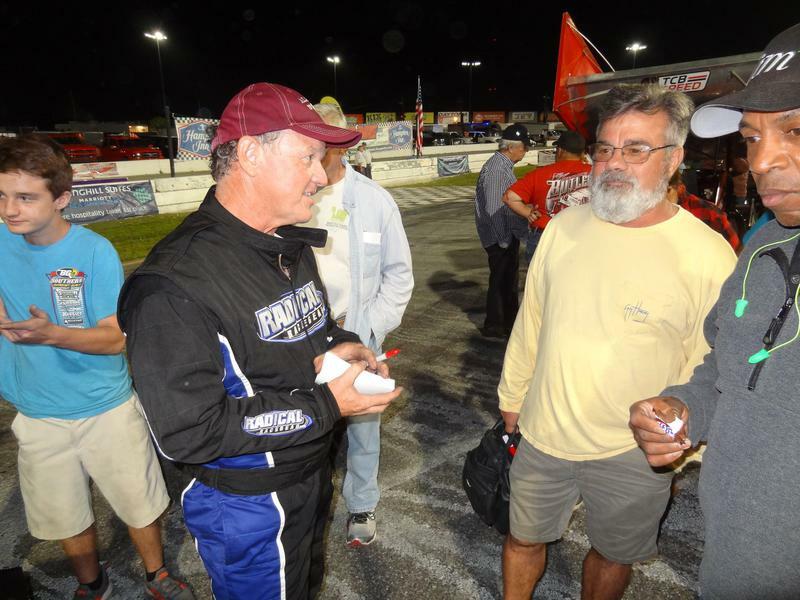 Jimmy won the feature, and got a handshake from Rob Kohler. ​The track crew gave Steven a handful of Suzuki 750 engine parts that exploded out of the #41. ​Look close and you can see some of the crazy skidmarks the car left on the track. 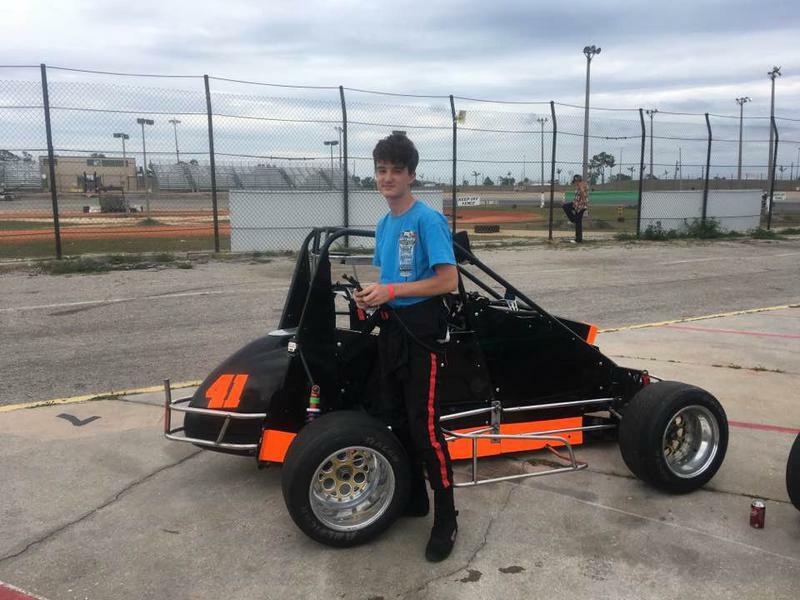 Steven worked hard on both of our race karts, so we made our return to the EL class. Now we need to update tires and freshen the engines. At least we are back on the track! After about 10 laps, the left-rear wheel flew off as I drove off of turn 4. I slid to a stop by the start-finish line, but the wheel ended up in turn 2. 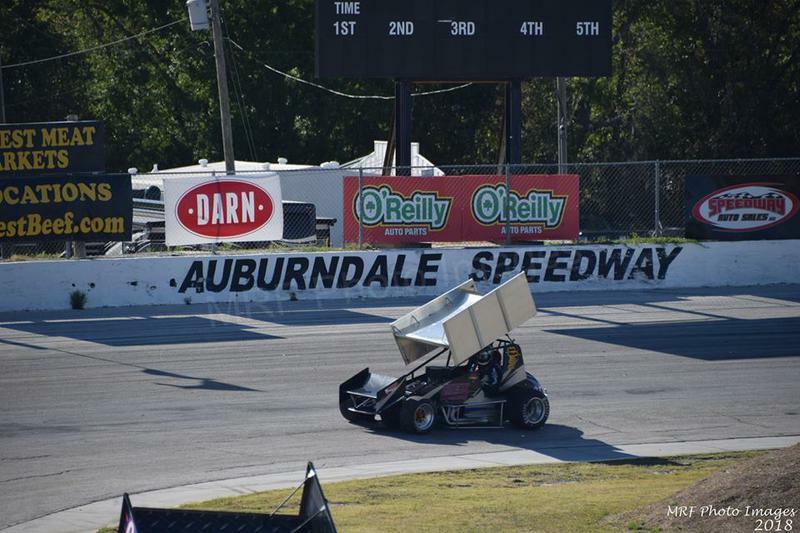 Overall, I was very fortunate that it happened on the straightaway and not in a corner. I didn't hit a thing and no one else was involved....very lucky indeed! ​It was great to be back at this excellent track! 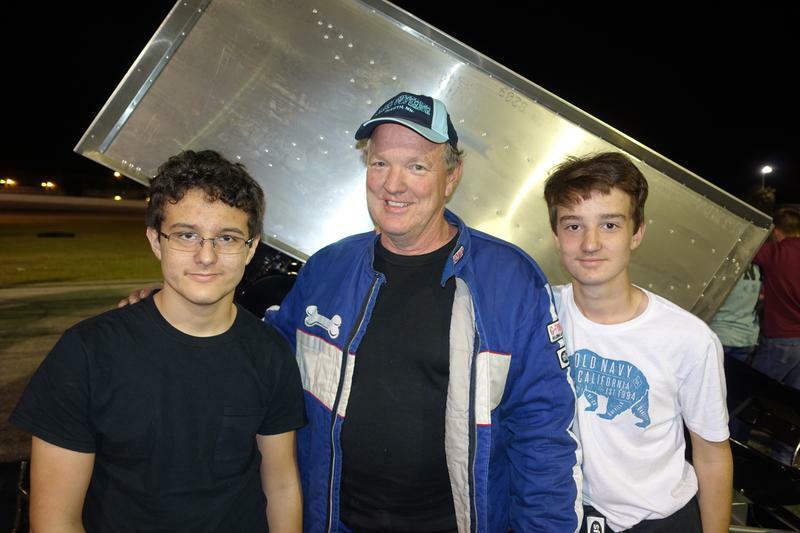 Jimmy Wilkins came along to toil in the heat with us, and we ended up 5'th on the night. 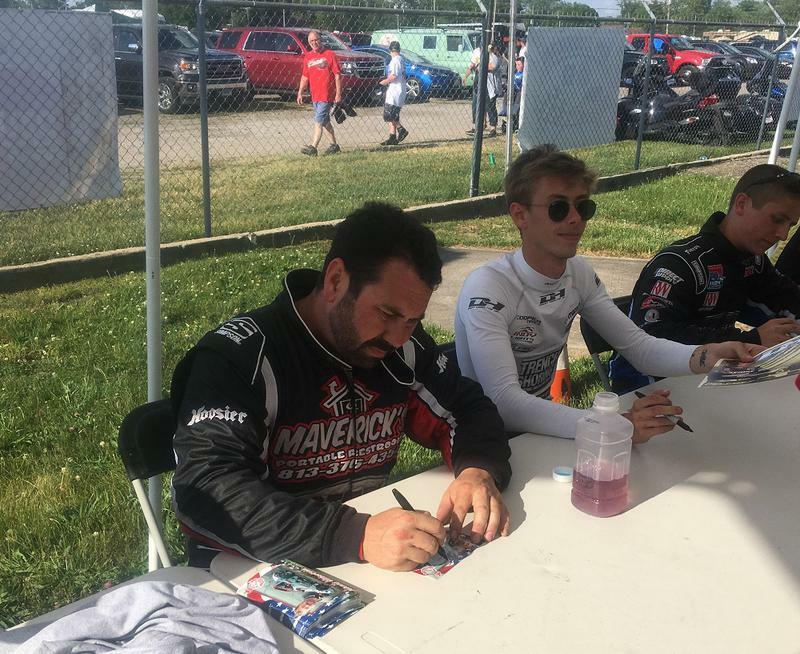 Believe it or not, we won the "Best Appearing Car" contest during the autograph session! The actual appearance of 85 didn't have much to do with the result, I am sure it was my crew: Robin, Matt and Steven, who won the crowd to our side and carried the day. We even got $100 (spent on pictures and a late night dinner at Denny's). Amazing! I got my first new firesuit in many years. ​This was a first....Steven raced, but I was on vacation. It was the first time he drove and I was not there to keep an eye on things. 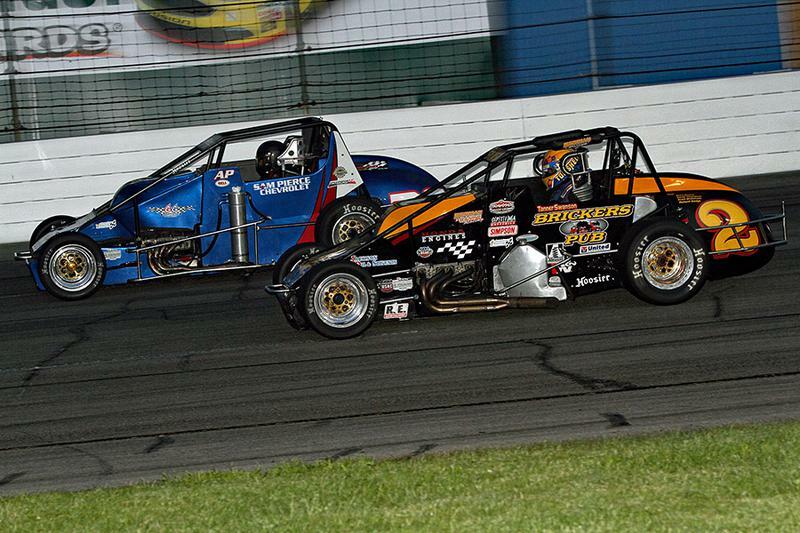 Fact is, he drove two cars tonight: the Wilkins midget #41, and Kevin Endee's Outlaw Modified #5. 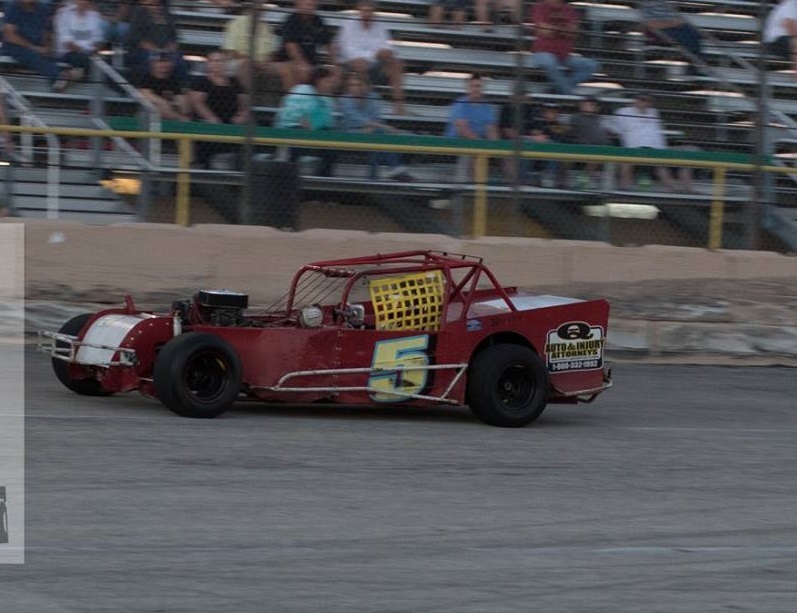 He finished 5'th in the TQ, and had engine problems in the #5. It was a scary night for Al Seitz. His engine exploded and the car caught fire. Thankfully, Al had on good safety equipment, but was still burned in spots. ​We took our second shot at the "EL" class. The two of us worked on Steven's 85 all day, and he got pretty fast by feature time. 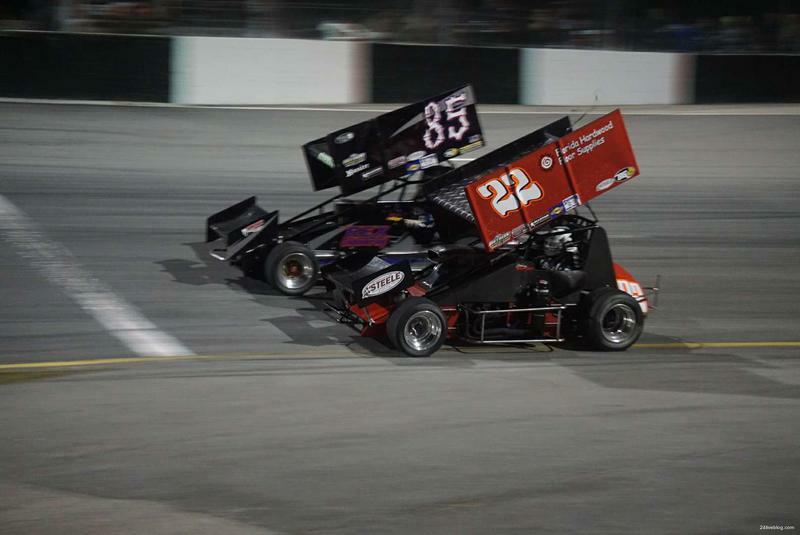 We raced side by side for most of heat #2....what a blast! Ok, this was a good night! Steven led the TQ heat for 6 laps, but ended up second. 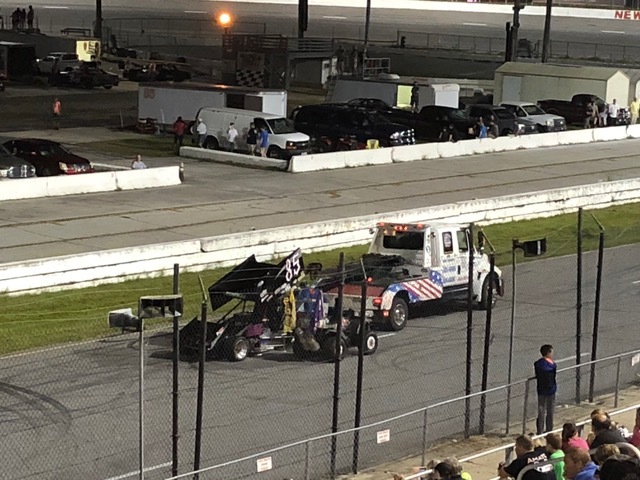 The feature was hard fought: passing, repassing, spins, starts, etc... On a lap 20 restart, the kid lined up 4'th and went 3 wide around the car in front. He was next to the leader, and kept him pinned down for 3 laps as Steven tried to take the lead on the outside. He came up a bit short and finished second. Damn, what a race! We showed up at Speedworld for their Sunday afternoon event. 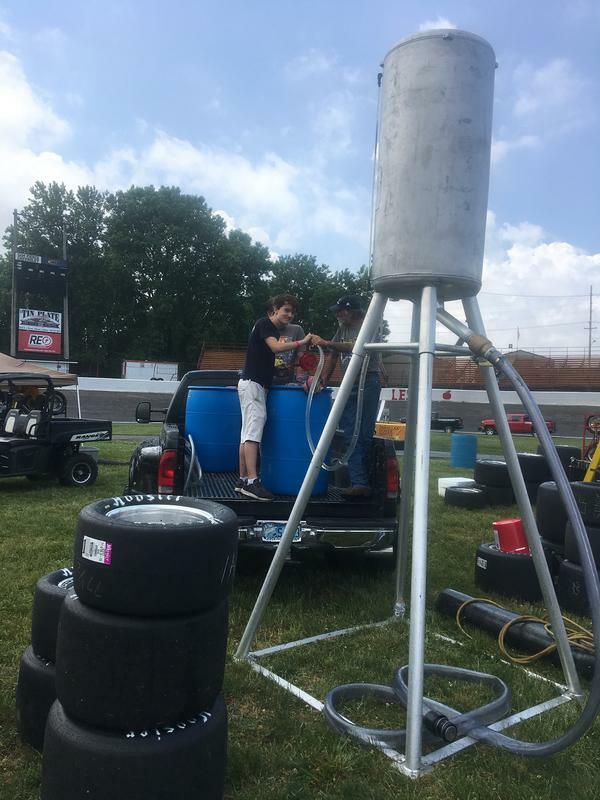 Steven and Matt turned the karts around after yesterday's race, and we all got to practice a bit. 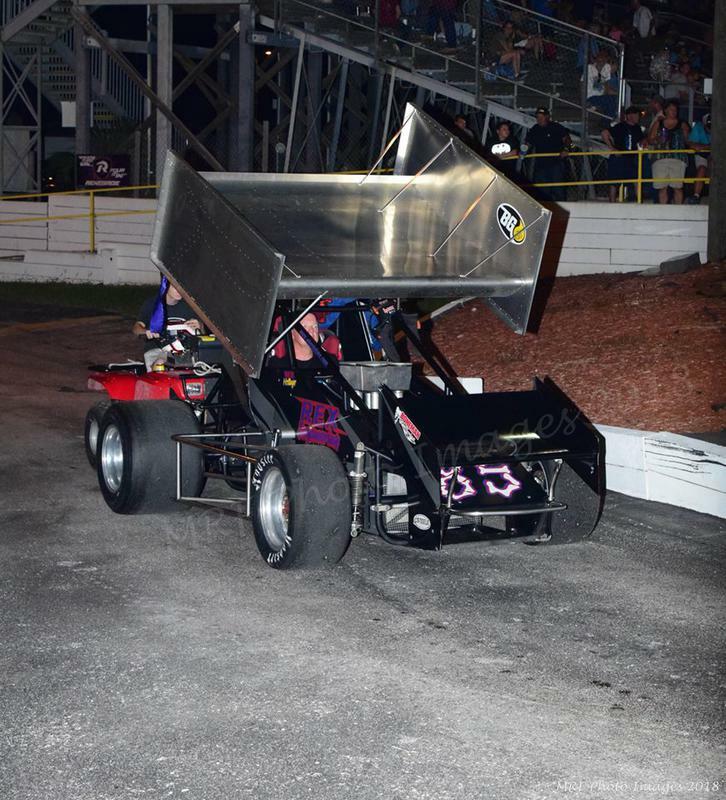 However, the Curse of Speedworld struck again, and our feature was rained out. ​Christian "came out of retirement" today and raced the EL class with Steven. It was great to see him back in action! We struggled a little today: Steven's 85 was a little flat (fuel problem) and he finished 5'th. Christian hung in there and ran 8'th. 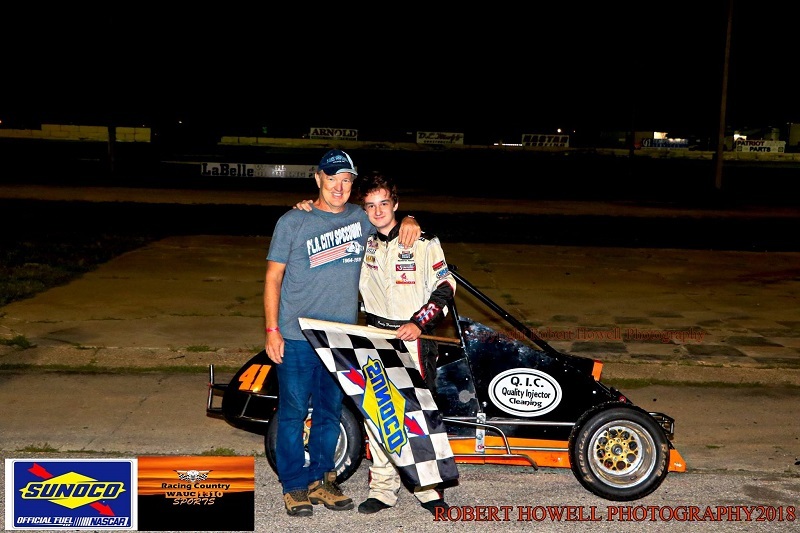 We came to the final TQ race of the year with two goals: win "Rookie of the Year", and to win the race. We only got one! 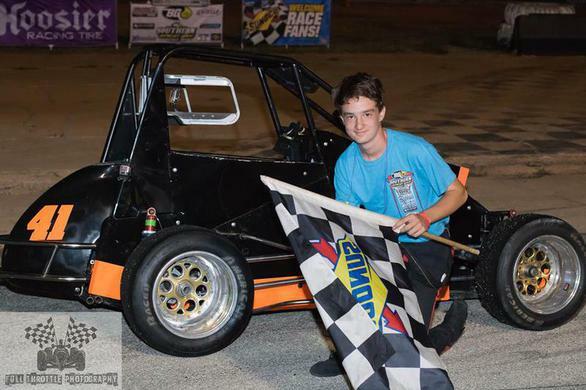 Steven is the 2018 Florida Midget Racing Association Rookie of the Year. 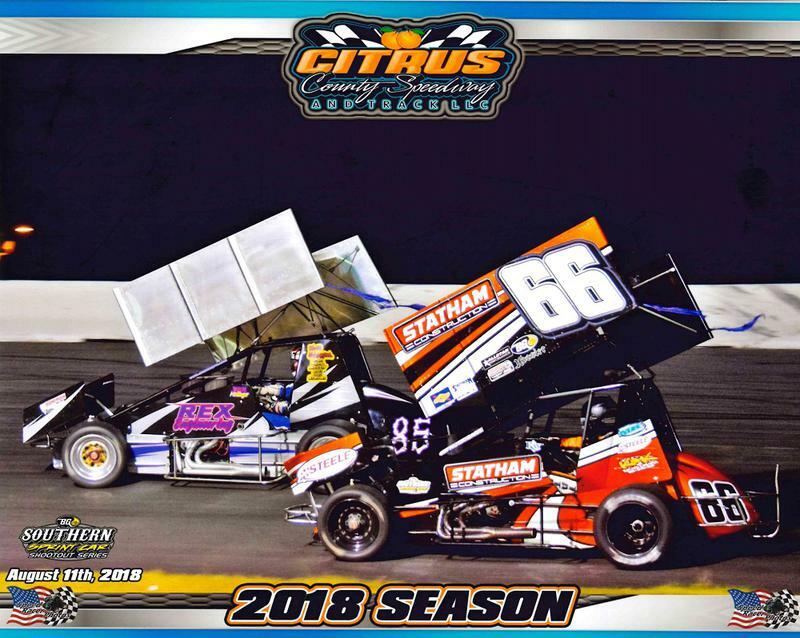 This was completely unplanned, and resulted from a last second decision by Stuart Chamberlain to put Steven in his back-up car at Auburndale. 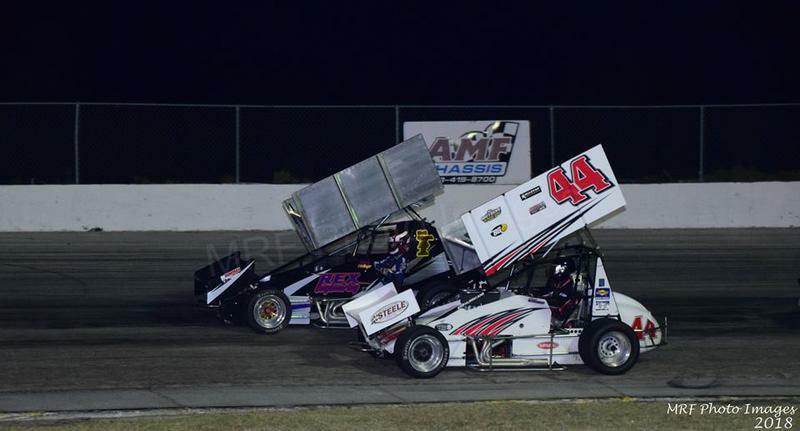 After that, Jimmy Wilkins gave him the opportunity to drive his potent #41 for the rest of the year. 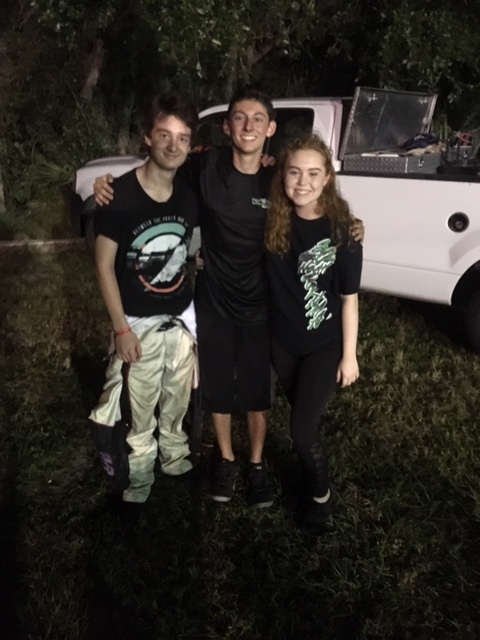 Many thanks to both of these fine racers for giving my kid a shot! We made a last minute decision to run the Pilgrim 100. The #85 had a problem that cost us most of practice, and our qualifying time was not very good. 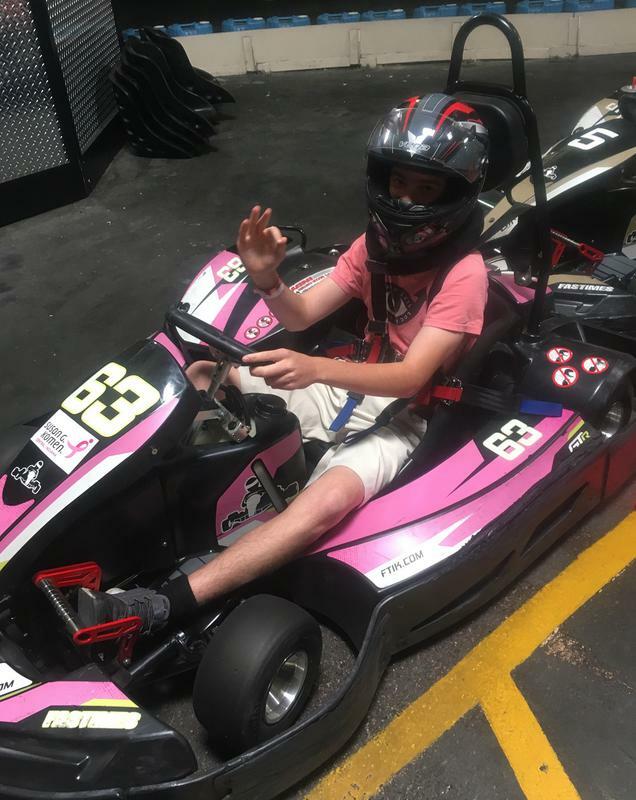 But during the race, Steven picked up some speed and had a good time out there. Jimmy got taken out by second place (and flipped) while leading. The flip broke the steering, so he was out for the night. 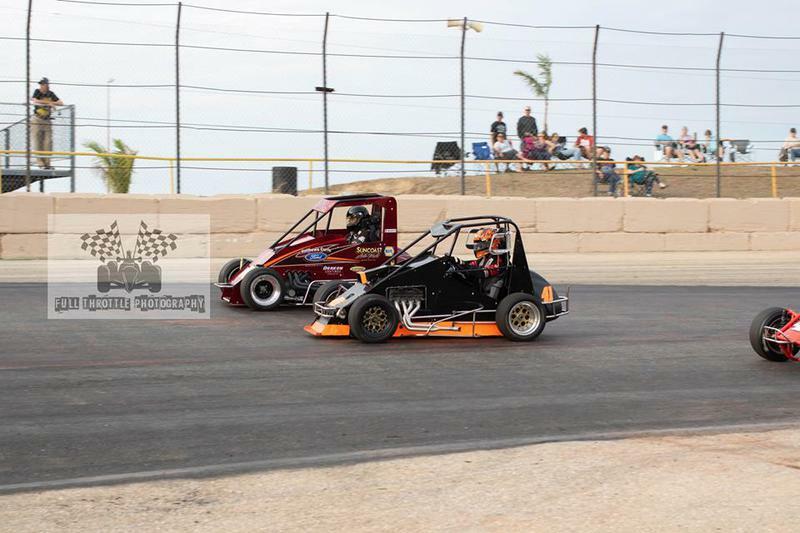 Then Steven was leading the feature, and he got turned around by second place. This tore up the starter motor, and the 41 could not be re-started. "Chaotic action is preferable to orderly inaction". 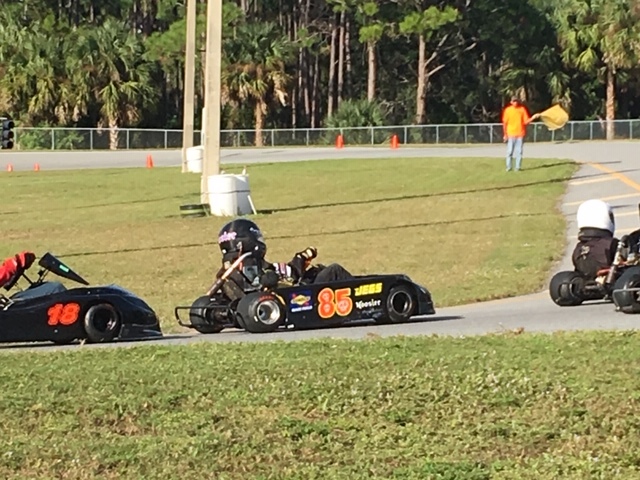 Another last minute decision, and another that we do not regret, Steven and I raced at the WKA Nationals held at Daytona International Speedway. 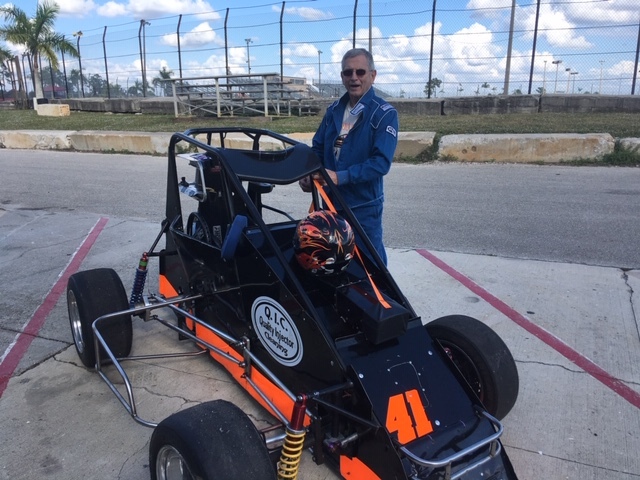 Steven drove my #15 kart this time. 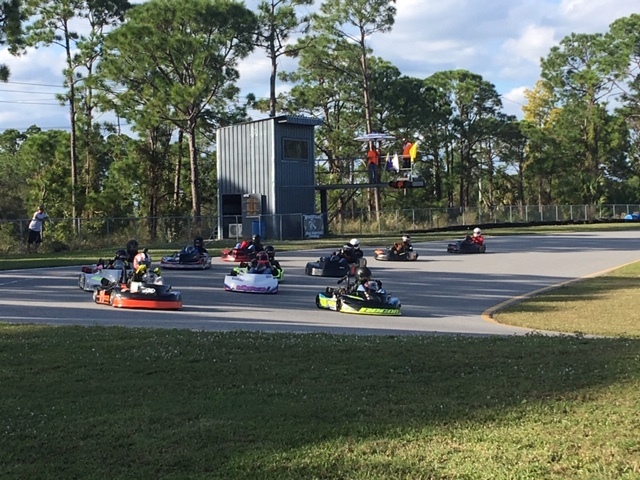 WKA even had a class for Saturday night, short track 4 cycle karts like ours. 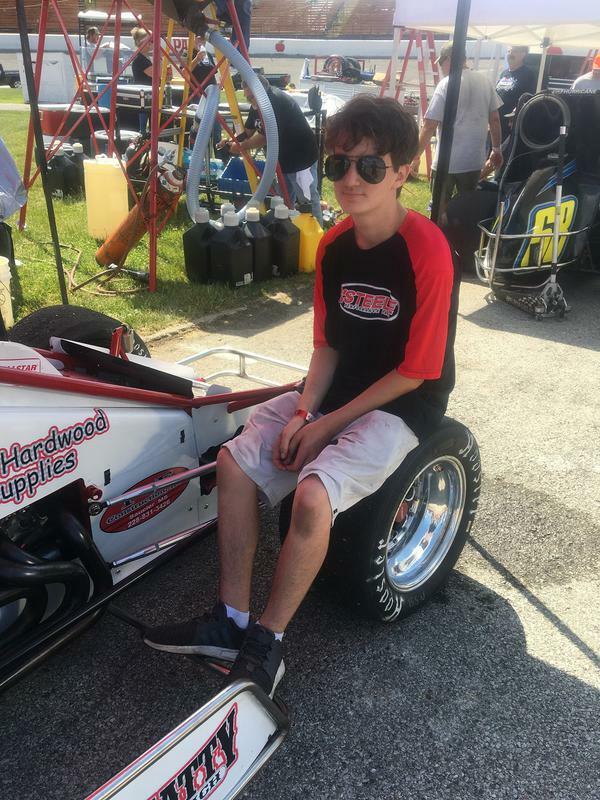 He went out for two practice sessions and a 30 minute feature. 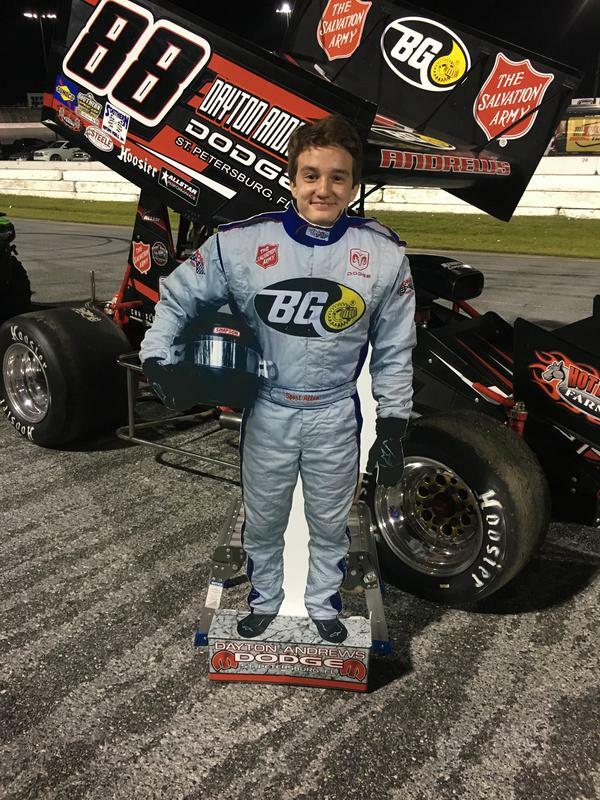 The day was so long that his feature race finished "under the lights", so that added another dimension to an interesting and fun day. I sent him out there with the wrong gear. We know this fact because he passed the whole field before turn one, but when most of the others got wound up, they passed us back. Live and learn....we'll be back one day with more lively equipment and try again! Matt came along to help out too. 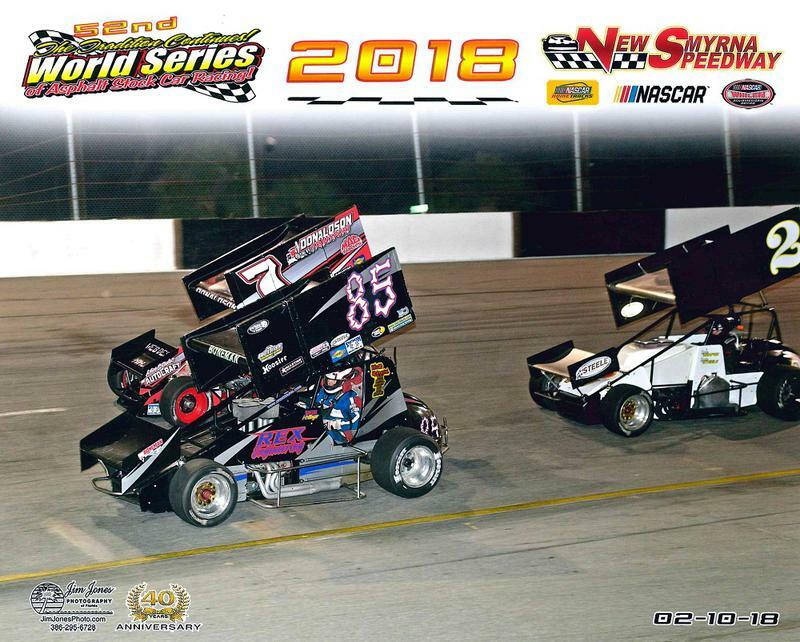 2018 ended on an unusual note: I sold the sprint car and delivered it to the new owner as the sun went down on New Years Eve. Obvious metaphors aside, I will be back in sprints, and also in whatever kind of car I can arrange. 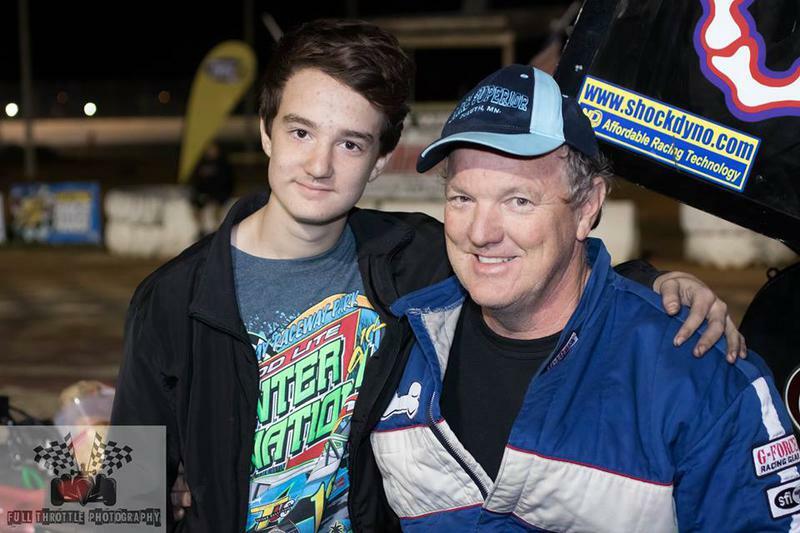 I have loved the last 7 years in sprintcars, so I am just between rides for the time being.